What if we stop talking about infrastructure as a noun? What if we talk about 'the infrastructural,' that is, as an adjective that does not refer to things but rather to their qualities? But if we do so, how do we read and evaluate those qualities? For instance, how does the infrastructural of a city differ from the infrastructural of a conversation around a table? This interview deepens these questions until leaving us closer to the infrastructures of meaning. Figure 1 Reinhold Martin. The Urban Apparatus. Mediapolitics and the city. Minneapolis: University of Minnesota Press, 2016. Cover. 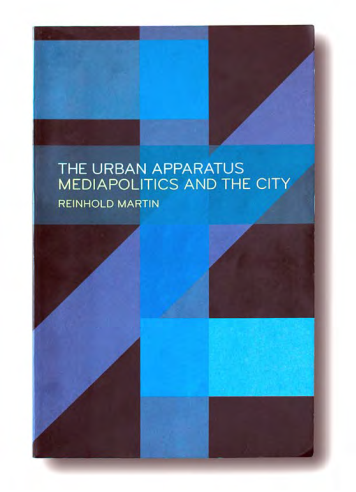 Pedro Correa, José Lemaitre: In your last book, the collection of essays titled The Urban Apparatus: Mediapolitics and the City (2016), you begin by defining the city as hardware, as infrastructure. Also, elsewhere, you have defined architecture as a “complex of material and discursive infrastructures with irreducible aesthetic, social, and technological properties and consequences” (Martin, 2015). What do you mean here by ‘infrastructures’ and how far do you think the concept can be extended? Reinhold Martin: In the book, I define infrastructure as “what repeats.” By this, I mean anything that can be scheduled, timed, anticipated, orchestrated, regulated or coordinated. In other words, adapting Cornelia Vismann’s definition of “cultural techniques” (2013) as the verb form of media, infrastructure either works or it doesn’t. Less a thing-in-itself than a characteristic of things, it is better to speak in this case not of a class of objects defined as infrastructure, but rather, of the ‘infrastructural’ properties of a given object, be it a city, a building, or a doorknob. Although they can be quite regular, like a train schedule, or quite variable, like the clicks of a water meter, the infrastructural repetitions to which I’m referring, all share this time-bound quality. Similarly, on the spatial level, it is less a question of extending the category to absurdity than it is of recognizing how infrastructure operates at all scales, indeed, how it operates as a scaling device, measuring and calibrating our relation the world, to one another, and to ourselves. Although The Urban Apparatus takes ‘the city’ as its primary object, defining cities as infrastructural hardware puts the focus on sociotechnical processes rather than on beings per se. It also introduces scale as a question - at what scale can something be called ‘urban’? - rather than as an anthropometric default. Furthermore, defining architecture as an infrastructural complex takes the focus off the building as a standalone object, or as a ‘mirror’ of a standalone subject, and refocuses on relationships - technical, spatial, social, and so on - at all scales. Finally, I’ll add that although emphasizing timing, scheduling, and coordination may seem to cast infrastructures as fundamentally bureaucratic, instrumental, or ‘rational’ (shades of Max Weber? ), insisting on their aesthetic properties prevents this sort of reduction. That is, when we understand aesthetics, with Nietzsche, as something like the interplay between Apollo and Dionysius, order and disorder, reason and madness, and the like (Nietzsche, 1994). On the aesthetic plane, infrastructure orders. PC, JL: If it is not a function of Weber’s rationalisierung, then infrastructure would not only order but also to some extent disorder, right? Or rather, produce the aesthetic tension between both. Like the gap between the consolidated, gridded city and the informal, precarious ‘city of slums’? RM: Yes, order and disorder go together, but not necessarily in the usual sense that opposes ‘formal’ to ‘informal’ when describing urban life and urban space. It is important to acknowledge that slums in particular and precarity in general belong to the neoliberal order of capital. Under this otherwise quite heterogeneous regime, socioeconomic inequality is intentional; it is part of the system, not an unfortunate, accidental byproduct. Urban slums and other seemingly disorderly spaces, and the lives lived within them, are therefore highly ordered in two senses. First, they are sites of intricate, improvised survival strategies that only seem ad hoc to outside observers but are in fact intensely rational. Second, such sites belong to the larger urban order, as reservoirs of sub-proletarian, ‘informal’ labor; that is, labor without even the minimal protections traditionally afforded to an incipient, semi-organized proletariat, and therefore more easily exploited, and expended. PC, JL: It seems the aesthetic dimension you incorporate also opens up an angle not entirely comprised in previous uses of the term ‘apparatus’ - as in Foucault’s (1980) or Agamben’s (2009). In the book you define it as a “non-illusory semblance of order” (Martin, 2016:3) relating it to Nietzsche’s Apollo and Dionysius but also to his ‘will-to-power’ as a way of producing ‘knowledge’; would you explain your notion of infrastructure as an instrument to produce visibility, to render the urban ‘knowable’? RM: It may seem perverse, then, to speak of such a situation in aesthetic terms. But yes, you are right, I have tried to modify earlier uses of the term ‘apparatus’ (whether Foucault’s dispositif or Althusser’s appareil) to account more explicitly for something like the aesthetic dimensions of power (Althusser, 2014). To speak of order in this sense as ‘non-illusory’ and yet a ‘semblance’ is to recognize its flatness, its paradoxical self-evidence: what-you-see-is-what-you-get. In the case of urban slums, the ‘semblance of order’ lies in their apparent disorder, which seems to reconfirm the rationalizing order of the metropolis by opposition. But underneath and through both ‘slums’ and ‘city’ flows a power struggle, like a river out of which both emerge. This semblance, this apparent disorder, is non-illusory in the sense that it is the work of an infrastructural apparatus, a system of systems that mediates the power struggle and sets up this distinction in the first place, like the hyphen that joins pairs like order-disorder, or formal-informal. The pairs themselves constitute the “non-illusory semblance of order.” They are as real as any artwork: Ariadne’s thread. In alluding to the differentiation and ordering performed by a kind of collective, artistic will analogous to Nietzsche’s will-to-power, I am also taking some distance from Henri Lefebvre’s notion of the city itself as an artwork, or oeuvre (Lefebvre, 1996). Lefebvre, who seeks an antidote to the excesses of rationalization thinks he has found it in the spontaneous, ‘festive’ character of the pre-industrial city. Associating festive, improvised play with use value and everything else with exchange value, Lefebvre, I think, aestheticizes human creativity and in the process, merely reproduces another version of the distinction we have been discussing, albeit a potent one. My response, with the “urban apparatus,” is to show that sociotechnical artifice is what makes the city and its contradictions knowable in the first place, not what distinguishes creative oeuvre from commodified product. This does not mean that there is no such thing as a city per se, or that the human “right to the city” is illusory; it only means that when we say ‘city’ today, we are doing the mediating work of the urban apparatus. PC, JL: The rewriting of such pairings like Lefebvre’s “oeuvre” and “product,” but also the “town-country” and “near-far” antitheses (Martin, 2016:9-13), seems fundamental to convey how this infrastructural apparatus works, precisely by ‘mediation.’ Does this mean, as the epistemic a priori of these oppositions? PC, JL: In the book you also suggestively describe the aesthetic dimension of logistics, demographics, statistics, and so on, as a “mathematical sublime” - with Kant (Martin, 2016:43) - bearing certain “structures of feeling” - with Williams (Martin, 2016:34) - that account for ‘abstraction’ in quite a different way than the one produced by much of the work of critical theory in their readings of the Großtadt. How does the numerical, and its ‘affective’ quality, account for the dissolution of the modern Metropolis? RM: If the production and management of both aesthetic and political order is one important function that distinguishes mediapolitics from a more general politics of life, or biopolitics, it might seem strange, then, to have recourse to Kantian categories like the sublime to specify its affective dimensions. But yes, you are right, connecting the mystique of urbanization - including its commercial appeal - to the seeming infinity of the mathematical sublime rewrites abstraction not as dehumanizing but as humanizing. Who is the subject that stands in awe before the allegedly self-regulating patterns of the financial markets but a new kind of human, an emotionally sensitive entrepreneur awash in oceanic feeling? So yes, those markets and the material complexes - including buildings and cities - that form them reproduce a sublime aesthetics that freezes us in place, standing before them like spectators in a museum. Mediapolitics builds and populates that museum, in which what we still call Wall Street appears as a sort of anachronism that converts the overwhelming, deadly force of the financial markets into a picturesque urban stroll. To ‘occupy’ Wall Street would therefore be, in part, to take over the museums - both actual and virtual - erected by the urban apparatus, and to show that what art theory still quaintly dismisses as a ‘spectacle’ devoted to the fetishization of abstract commodities is, in fact, the latest set of techniques for reproducing all-too-human capital. PC, JL: Speaking about that set of techniques, in your piece “Pittsburgh, Paris, Charlottesville: The Infrastructure Question” (Martin, 2017) you play with the idea of the fate of a Confederate general's statue being an ‘infrastructure question’ - a project for reproducing the racially loaded economy of owners and slaves under the much repeated (even in Chile) motto “Make America Great Again.” Criss-crossing political, economic and environmental histories, this particular notion of infrastructure also encompasses the historicity of ‘the mass’ as body politic against a social-media produced society of differentiated individuals. How does infrastructure, in this case as a memory-project, produce such political bodies; such ‘negotiations of our humanity’ like the one revolving around the “right to the city” but also the one assembled by white supremacists defending General Lee's memory? RM: I’m sorry to hear that American propaganda slogans are echoed in Chile as well. The keyword in that one is, I think, “again.” It allows many to hear what they want. For the white supremacists, “again” harks back to the days of slavery and of General Robert E. Lee. But no, I don’t think that this is merely a social question, a simple matter of defending or recirculating racist symbols. It is infrastructural in both of the senses to which you allude. First, what the American (and to some extent, transnational) public sphere has come to call “Charlottesville” depends on the repetition of slogans, images, and invective in a manner that differs considerably from, say, a Leni Riefenstahl film of a Nazi rally, even though the two share many important characteristics. This newer type of repetition rewrites history as binary and symmetrical - “there are two sides to every story” - thus the American president’s claim legitimizing the white supremacist Nazi sympathizers. It is, in that sense, a type of formalism, but an infrastructural one that needs to be reiterated in numerous media. Hence the American televisual system of competing, allegedly symmetrical cable news channels, or the regular attempts by the “mainstream” press to give equal voice to opposing views, even if the opposition is based in vile assumptions or aims. Memory, under these conditions, is more like a compulsion to repeat than it is a critical faculty. Second, infrastructure works here not to integrate an organized political body, but to divide it, and to constitute a new kind of fascist body by repeating and multiplying these allegedly symmetrical antagonisms. This may seem nonsensical, since we have come to associate ‘mass’ psychosis with lining up before a messiah. But I think “Charlottesville” belongs to a different kind of movement that is directly opposed to the popular, democratic movements that have swept the globe in recent decades, and the two must be seen together. Not as two sides of a coin, but as combatants in a struggle to reorient the neoliberal maelstrom. The white supremacists and their allies (who, by the way, are far from representing the “white working class”) have, for different reasons, felt the rug of political and economic authority pulled out from under them. In other words, they have experienced imperial decline. 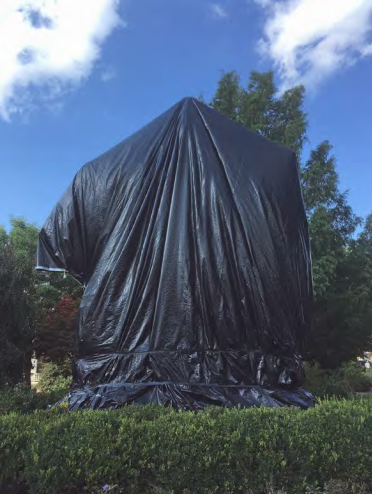 In that sense, they are fighting to protect the pedestal on which Robert E. Lee sits rather than the figure of the general himself, waiting for their turn. That is one reason I argued that the statue in question has not yet been cast; it is the future statue of the current American president that he and his followers are defending. But in order for them to do so, certain infrastructures need to be consolidated, others destroyed, and others rebuilt, beginning with the pedestal. Several essays in The Urban Apparatus address the historical context for this in what we can call ‘architectural’ terms: One on the racial segregation of housing, another on neoliberal, “broken windows” policing targeting black men, and a third on the deindustrialization of Detroit. Adding the e-flux essay on Charlottesville to these would mean, among other things, introducing “Pittsburgh” into the equation. In that case, a deindustrialized “rust belt” city sought “rebirth” (“Renaissance”) through postindustrial development and, through its progressive mayor, pledged adherence to the Paris climate accords even as the us withdrew. The problem is seeing a case like this in isolation. As the oikos in both ecology and economy reminds us, industrial and consumer-driven climate change is a project of household management, a form of domestic economy practiced at the scale of the planet. At this point, with all that has been known for decades about carbon emissions and other factors, we must recognize the irreversible transformation of the planet’s climate as deliberate. Like socioeconomic inequality, climate change is not the unfortunate byproduct of a well-meaning system; it is the calculated consequence of unevenly distributed risks, the most vulnerable targets of which are more likely to be residents of Puerto Rico than of Pittsburgh. This is not to say that Pittsburgh has not seen its fair share of racial and economic violence. It has. It is only to redraw the map in accordance with the neoliberal calculus, as I have attempted also to do in the book. Returning for a moment to “Charlottesville,” it is more than just ironic that the American president defended white supremacy at a press conference intended to launch his program to privatize the country’s crumbling public infrastructure. Billed as “creative destruction,” such programs are being road tested in cities like Detroit and New Orleans, and now in Puerto Rico (and, thanks to the bankers, in southern Europe, and of course earlier, thanks to the “Chicago Boys,” in Chile). As with “broken windows” policing and the rest, the challenge is to recognize the links between racialized state violence and private profit, and to link these in turn to the planned, uneven devastation of the planet’s ecosphere. It may indeed turn out that there are no lifeboats when it comes to global warming, but the transnational oligarchy is busy rearranging cities and countrysides in anticipation of just such an eventuality. With some fringe exceptions, climate change denial functions much like the “again” in the propaganda slogan. It is a stalling tactic, a delay to buy time while the new infrastructures are put in order. PC, JL: Both the “broken windows” and General Lee’s ‘pedestal’ seem to share the same function with the oval seminar table you analyze in your other essay “The Dialectic of the University” (Martin, 2015): they all work as leveling devices that would presumably put the aforementioned antagonisms on the same plane. If infrastructure works by repeating and multiplying these allegedly symmetrical antagonisms, how does architecture become the bridge that puts them in relation? RM: Well, I would say first that pedestals and tables are quite different in this respect. Yes, in principle, seminar tables even things out to a degree, since everybody is allowed to speak and the authority of the lecturer is diminished, though of course hierarchies (which are not necessarily antagonisms) remain. In the article you mention, which is part of a work-in-progress on universities as media systems, I tried to show how something like a literary or philosophical canon was worked out and circulated as a list of books discussed around a table in a seminar. Drawn from other, longer lists, this list established a hierarchy of books for students to read, which is no different to what we do as teachers every day. Except that, in this case, the aim was to derive the conversation around the table more or less directly from the list and in the process, to sacralize the syllabus of the “Western canon.” This, I think, is the opposite of teaching; it is training in the authority of lists. But that is a very far cry from the world of “broken windows” policing, except that, perhaps not entirely by coincidence, both pass through the University of Chicago: one (the seminar) as a way to build a common humanities culture for undergraduates, and the other, via the same neoliberal economic theories that gave Chile’s “Chicago Boys” their name. In The Urban Apparatus, I tried to show how that type of policing interprets criminal behavior as a cost-benefit equation, where petty crimes, like breaking windows, are punished with excessive penalties. The idea, being that potential criminals are entrepreneurs who will make a rational calculation and conclude that the benefit is not worth the cost. But the same police discourse, developed by economists like Gary S. Becker (1968), also aestheticizes crime by linking it with unruly, irrational behavior, on the one hand, and a disorderly environment, on the other. A window, from this perspective, sits at a kind of threshold between order and disorder. Police discourse locates certain social groups, like African-American men, at that threshold as, in effect, windows ready to break. The equations guiding all of this are therefore hardly rational. Like their symbolically intoxicated, hardly sober authors, these equations are saturated with fear and pleasure. They are, in that sense, aesthetic objects. Neoliberalism, as Foucault showed, is about much more than just market fundamentalism and privatization. As for the pedestal, it elevates things. Quintessentially infrastructural, pedestals make distinctions. As we were discussing earlier, the particular pedestal in question does not merely elevate a historical figure, it elevates the entire infrastructural system - slavery - to which he and it belong. At the interface of aesthetics and politics, the conflict is therefore over the pedestal as much as it is over the sculpture. That is because, in all of these cases - tables, pedestals, windows - architectural or infrastructural elements act as mediators. More than simply establishing relationships (among talkative teachers and talkative students, memory and myth, inside and outside), they mediate them to establish value. Sometimes, they help to produce or maintain inequalities and asymmetries; other times, they connect. In describing these elements as ordering devices that work through repetition, I have also tried to think differently about things like bridges as aesthetic operators. The aesthetics of bridges - their ‘architectural’ qualities, so to speak - are usually discussed using terms like ‘beautiful’ or ‘sublime.’ By recasting aesthetics, in the Nietzschean way, as a discourse of order and disorder, I want to ask: How does a bridge help to order the world? What escapes its grasp? What categories of things does it join and separate? What relations does it make visible? What does it occlude? Caught in traffic on the George Washington Bridge (which connects New York and New Jersey and is named after another historical figure with connections to slavery), we might reasonably wonder: Is this stasis, this interruption of the flow, part of the urban order, or its disorderly antithesis? The bridge and its namesake: as Apollo or as Dionysus? Rather than thinking of buildings, bridges, and other urban hardware, then, as technical instruments that resolve primordial, almost metaphysical antagonisms, we might think of social, economic, or even philosophical antagonisms as hardware-based but not hardwired. The ancient Athenian Pnyx was both a precondition and a limit for democracy. And, just as there is no reflection, philosophical or otherwise, without mirrors, there is no order during the modern period without paperwork, its authors, and its readers assembled around tables. Deservedly or not, likenesses of those signing the papers are sometimes put on pedestals. Follow the mediating threads of their conversations, lists, and equations, while remembering that not everything said around tables can or should be written down, and that disorder is not merely the opposite of order but its double, its condition of possibility, and you have the beginnings of a city worthy of the name: polis. PC, JL: Presenting this work about the university as media systems you’ve spoken of making not architectural history, but a history that bears architectural characteristics; of doing history ‘with,’ rather than ‘of’ architecture. First, we wonder if the self-contained material and discursive enclosures of architecture ‘as a discipline’ - which still depend largely on categories such as space and measure - have already disappeared from your horizon of thought; are these enclosures more an obstacle to overcome than something to clarify? Secondly, would you risk a comment on the space contemporary architectural history/theory occupies in relation to architectural practice, and with regards to other areas of ‘the humanities’? RM: Yes, doing history with architecture. Of course, all architectural historians do this to some extent. But it is not normally how we understand our task when we set artworks and their authors against the backdrop of a more general ‘history.’ First, I’ll clarify by saying that The Urban Apparatus does neither of these things, at least not systematically; its objects are only broadly ‘architectural’ and, though its perspective is nothing if not historical, it is not a work of historical analysis per se. Its emphasis is, instead, primarily theoretical. By contrast, my current work on universities is primarily historical, though it addresses theoretical questions very much related to those we have been discussing. It’s that work which I have in mind as an example of what it might mean to do history with architecture, with the further stipulation that ‘architecture’ be understood from a media-theoretical point of view - that is, as one among many media. Now, all of this is rather disrespectful of anything like a self-contained ‘discipline,’ and intentionally so. Not because I think that disciplines don’t exist or are outmoded but, on the contrary, in recognition of their historical significance. More than the history of architecture as a ‘discipline,’ I am concerned with the ‘architecture’ (or, if you like, the infrastructure) of the disciplines themselves, in the sense of the mediating systems, both material and cultural, which make the very modern idea of a discipline thinkable in the first place. Translated, this means that when we speak of a discipline like architecture, we are speaking of a historically emergent discursive formation, or (to borrow Friedrich Kittler’s terminology) a discourse network, not a timeless, transcendental category. Things get doubly complicated when we remember that in speaking of architecture, we are speaking of an academic discipline that is also a profession with its own history and its own specificity. Since the nineteenth century, scholarship and teaching in the history of architecture in the research-universities have belonged mainly to art history, while also being undertaken (in a different way) in the academies of fine arts and the polytechnics that preceded today’s university-based schools of architecture. These professional schools were oriented toward practice rather than scholarly research, as they by-and-large still are. Notably, most of today’s questions concerning the limits of disciplinarity come from this context. This suggests an understandable ambiguity - and also, an anxiety - regarding architecture’s standing as a system of knowledge, and its place among other such systems (i.e. disciplines) in the modern university. But implicitly, such questions also reconnect the academic discipline to the profession, just as they would if they were posed in fields like law or medicine. More than just obstacles to be overcome, questions concerning the limits of a discipline like architecture are evidence of the constantly shifting self-understanding of those who work at either end of the academic-professional axis, on the one hand, and along the axis that runs from the natural and social sciences to the humanities, on the other. In other words, I see the question of disciplinary limits, in architecture, as symptomatic of a larger and more structural ambiguity, rather than as a problem to be resolved in and of itself. If there is a problem here, it is with the profession, not the academic discipline. Where elite professionals remain dependent on academic discourse for legitimation, most scholars of architectural history (and theory) today turn their backs on this expectation, and orient their work toward the larger arena of historical knowledge. The resistance they face in doing this is twofold: on the one hand, from a profession feeling left out or threatened with delegitimation, and on the other, from hardly disinterested traditions within art history still bound to connoisseurship (however discreetly) that see social, cultural, political, economic, or material-technical history as mere background or context. But if doing history with architecture accomplishes anything, it is to show how understanding architecture, broadly defined, is a way of understanding historical change in all of these areas, and more. This is different from another way of relating ‘architecture’ to ‘history’ which is inherited from modernism: the idea that architecture, built or not, can itself help to change the world. One marker of this is the enigmatic term ‘utopia,’ about which I have also written at some length (Martin, 2010). Here, it is often historians who lead the way; architects, while rhetorically committed to innovation and novelty, more often than not find themselves - willingly or unwillingly - unable to think and work outside of categories given by the status quo. That is because change - real, categorical change - requires an in-depth historical consciousness able to deal with contradictory tendencies. Again, it is useful to consider the division of labor among different knowledge regimes. Rather than try to convert the architect into a historian (or worse, the historian into an architect! ), we might do better to reconsider how these different figures, with their distinct practices, protocols, and knowledge infrastructures, interact. Concepts like ‘space’ or ‘measure’ therefore remain useful only when they too are understood as historically situated and contingent rather than absolute. We have, for instance, many ‘spatial histories’ (more than enough of which cite Lefebvre) but very few (if any) histories of space. The latter is, I think, among the contributions architectural history can make that might also serve as a note of caution to enthusiasts of a ‘spatial turn’ in the interdisciplinary humanities. Seen as a flexible, historically varied discourse, architecture’s combination of humanistic and technical knowledge is especially suggestive in this regard. Although originally educated outside of universities, the architect is in many ways the archetypal humanist, a characteristic that is especially worth reclaiming for those of us teaching in architecture schools. Whereas, doing history with architecture, whether from within art history departments, schools of architecture, or elsewhere, transforms concepts like “space” by translating them from one discourse network to another, rather than simply importing or downloading them onto some common hard drive. Figure 3 Reinhold Martin. 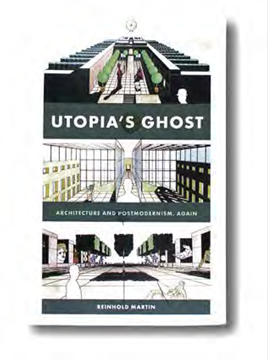 Utopia’s Ghost. Architecture and Postmodernism, Again. Minneapolis: University of Minnesota Press, 2010. Cover. I deliberately use media-technological terminology here in a manner that, I hope, can be understood literally as well as metaphorically. Think again about sitting around a table, conversing. Think about all the work that needs to be done, all the histories that need to converge, for a concept to be understood in the same way by all participants. Consider, for example, differences and similarities in how the term ‘space’ might be used and understood depending on where that table is and who is sitting at it. For our purposes: in an art history department, in a math department, in an architectural firm, in a meeting of astronomers, at an interdisciplinary humanities seminar, in a corporate board room, in a real estate development office, in a private dining room, and so on. One way or the other, architecture and its intersecting discourses have something to say about all of those different meetings, and meanings. But careful attention to the hardware with which each of those conversations is built might also tell us something we didn’t already know, not necessarily about the meaning of architecture, but about what we might call the architecture of meaning. * Reinhold Martin Architect. PhD, Princeton University, USA, 1999. His publications include The Urban Apparatus: Mediapolitics and the City (Minnesota Press, 2016), Utopia’s Ghost: Architecture and Postmodernism, Again (Minnesota Press, 2010), and The Organizational Complex: Architecture, Media, and Corporate Space (MIT Press, 2003). He is Director of the Temple Hoyne Buell Center for the Study of American Architecture (Columbia University, USA) and Professor of Architecture at GSAPP (Columbia University, USA). José Gabriel Lemaître Palma jlemaitre@gmail.com Architect, Pontificia Universidad Católica de Chile, 2012, M.Sc Urban Planning at Columbia University, USA. 2017. He has developed academic research related to issues of urban economics and social integration housing policies for Urban Magazine (USA), UPLand Journal (Italy), and ESE Business School Universidad de Los Andes (Chile). Pedro Correa Fernández pcorrea4@gmail.com Architect, Pontificia Universidad Católica de Chile, 2012, M.Sc Critical, Curatorial and Conceptual Practices at Columbia University, USA, 2016. Assistant professor at the School of Architecture UC, where he teaches courses related to aesthetics and politics.